Ive been playing this great mod and loved it. The darkness make an interesting enemy/ally unit as overpowered and still balanced as they are. Anyway, ive found six of the seven sisters but i dont seem to be able to recruit Aasayah. 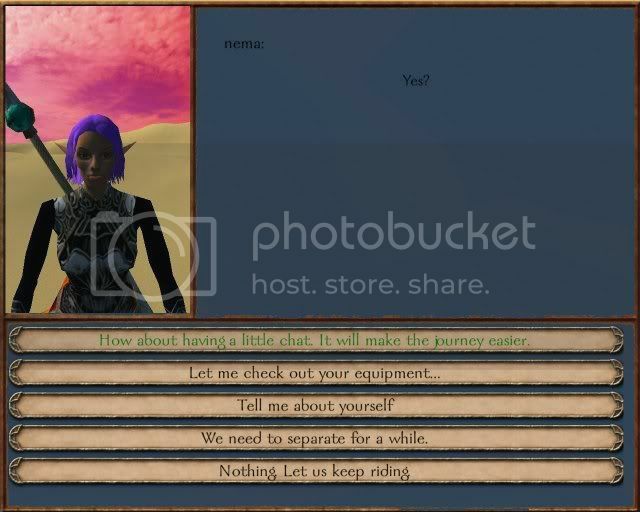 Ive just signed as her vassal, and talked her in person both in the world map (met her party) and in the tower of dreams, but no new dialog appears. Im wondering how to do it, ive tried to talk with all the sisters but none gives me an answer. Ah, thank you. I am happy that you enjoy. I am quite sure that I already told about Aasayah recruiting, but even I can not find where. It is quite mysterious how to recruit her. But now, when you already have 6 sisters, it will be easy. Ask kidnapped girl - Laia Thai. She offer different things. You can improve yourself, if you relay need it, or she can teleport your party to all towns. But she offer also traveling trough you dream. Ask her a little more about this. She can do such, that some one will apeare in your dream. It will be priestess Aasayah of course. And if you will need some help, you are welcome. Can you tell me about your race, equipment and army members, if it is not a secret. I think that as others special dialogs, this one also start with:"How about having a little chat. ..."
Ty for the answer but it seems not to be working. Ive talked with Lai Thai and asked to dream with Aasayah but nothing happends. I get a dialogue telling me not to speak to her cause its just a dream then im back to world map... is it that i have to "sleep" to meet her? If so, how? Some race generic units, not doing much atm as im fighting undeads. The 6 sisters using polearms or magic staff. The ost of it are the guardian sisters and brothers and the darkness, the rest are supporting troops. The rest its the best i can get atm: guardian helm lvl 3, f elf amor (stolen from the first sister Twy...), guardian greves, leather gloves. Comment: i have all the nemas basement books in my inv, but it would be nice to have the choice of not getting the bonus from having them in the inventory. Since i got them battles have become much less challenging but i really like their battle effects... well the ones i use at least. As I saw, you found right dialog. 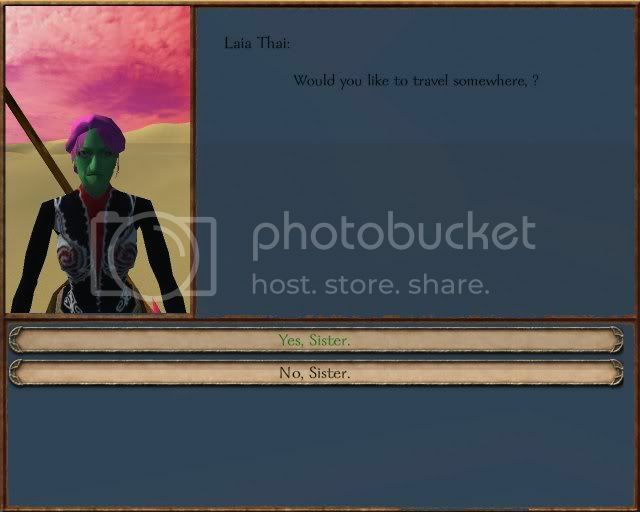 Before you talk with Laia Thai, you checked if you have enough place in your party for one more member, wasn't you? And then you checked in your party and Aasayah wasn't there? Khm, strange. Usually she appeared in your party. Thanks to told me about your party and equipment. I will separate spellbound books and bonus points to two different items, so player will have choice to use them or not, right? Damm, i thought she would squeeze somewhere or at least say something, but i guess she is a dream so she cant talk, lol. Anyway ty for the support. You know, it would be something neat that you indeed had to sleep (as i was guessing in my earlier post) to get Aasayah. Eg: you talk with Lai then go to a city or camp and wait till night, then you have the dream and she joins, what do you think? Yeah, you got me in the spell books part. Also, i havent tested it yet, but are you albe to lower your stats and skills with the hack option of Lai Thai? Again it would be a nice feature if you are looking for a way to make the game more challenging, for example you can take the lvl 10 surgery from durdana, or make a no str char when you are already of a high lvl so it wont be that hard to survive from that moment onwards. Thanks you for suggestions and information. New version of M&B is out. Well, work will wait for stabile one or even better, I hope on 1.0. Until then I will wait with work. But, if you need some help... just tell, or if you have some other interesting idea.